The area provides several events, classes, resources and opportunities to help seniors remain active and healthy. • Cleveland Clinic: Spring into Health Fare is March 21 from 10 a.m. to 2 p.m. at the Cleveland Clinic Lou Ruvo Center for Brain Health, 888 W. Bonneville Ave. The event offers health, caregiving and educational resources as well as health screenings, health and wellness presentations and representation from caregiver facilities and resources. For more information call 702-483- 6000. • Adults with mild memory problems are needed for an exercise treatment trial called Exert at the Cleveland Clinic Lou Ruvo Center for Brain Health. The main purpose is to analyze the effects of exercise in adults diagnosed with mild cognitive impairment. This free study will examine two different types of exercise in terms of brain health — motion-related exercise versus high-aerobic training. Men and women ages 65-89, who have been diagnosed with MCI and are willing to remain in the area for 18 months, are eligible to participate. Participants will receive a free membership to two designation area YMCA’s. For more information about the trial, including enrollment call 702-483- 6000 or visit Clevelandclinic.org/clinicaltrials. • Discover how healthy your brain is through the Cleveland Clinic’s healthybrains.org. Sign-up for a free brain check-up to receive a personalized brain health report. Learn more about the six pillars of brain health. 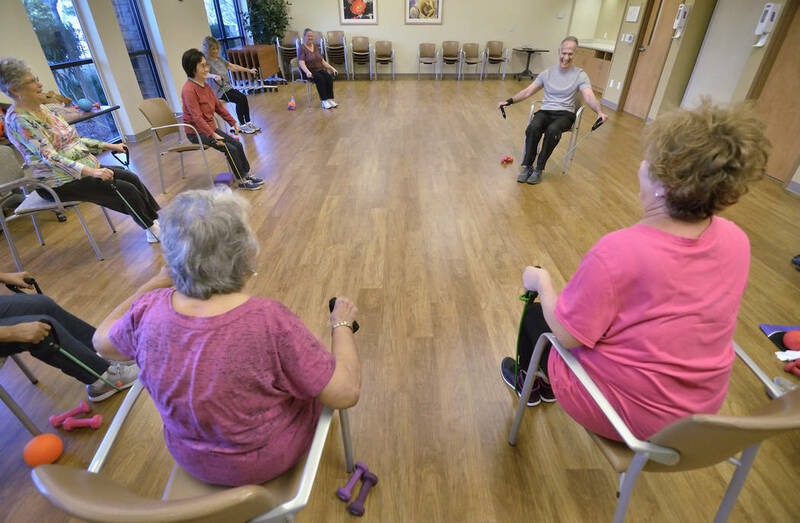 • Southwest Medical Lifestyle Centers offers exercise classes, quilting, knitting and crocheting, arts and crafts, line dancing, computer training, Wii bowling league as well as other activities and health presentations for seniors. Visit smalv.com, click on the Lifestyle Center tab to discover class schedules and other senior activities at Lifestyle Center locations: 5820 S. Eastern Ave., Suite 100, 702-797- 2353; and 8680 W. Cheyenne Ave.; and Social Club, 8670 W. Cheyenne Ave., Suite 105, 702-750- 3425. Dignity Health offers several classes for seniors including. Ageless, a low-impact dance class; Ageless Woman workout; beginning yoga, grocery shopping tour with a registered dietitian, flex fusion, fitness testing, enhance fitness. Visit here for more information and class schedules. • The Interfaith Council of Southern Nevada, 702-900-6840. • Volunteers in Medicine of Southern Nevada, Ruffin Family Clinic, 1240 N. Martin Luther King Blvd. ; and Paradise Park Clinic, 4770 Harrison Drive, No. 200, 702-967- 0530. • Stanford Center on Longevity, longevity.stanford.edu. • Nevada 2-1- 1 helps Nevada citizens connect with the services they need. 2-1- 1 is a special number dedicated to provide information and referrals to health, human and social service organizations, including support for seniors and people with disabilities. Call 2-1- 1 or 1-866-535-5654 or text your zip code to 898211 or chat with Nevada 2-1- 1 on Facebook or Twitter. • The Foundation Assisting Seniors’ new location, 2518 Anthem Village Drive, Ste. No. 102 in Henderson, is now open. The Foundation provides medical equipment, limited home maintenance and limited transportation to seniors at no cost. • Catholic Charities of Southern Nevada, 1501 Las Vegas Blvd North. 702-385- 2662 foster grandparent, senior companion, retired and senior volunteer program, telephone reassurance, meals on wheels, senior medical nutrition therapy. • Clark County Social Services Senior Services, visit clarkcountynv.gov. • Clark County Senior Advocate Program provides information and referral on topics including Medicare, prescription drug programs, utility assistance, senior housing and social service programs, 1600 Pinto Lane, 702-455-7051, accessclarkcounty.com. • To report abuse, neglect, isolation and exploitation of seniors over the age of 60 contact Elder Protective Services at Nevada’s Aging and Disability Services Division 702-486- 6930. • Healthy Living Institute at 901 Rancho Lane, No. 180 offers activities, classes, senior celebrations. Call for more information 702-383- 2229, umcsn.com. • Nevada Senior Services provides adult day care centers, memory loss programs, comprehensive geriatric assessment, caregiver support groups, chronic disease self management, smoking cessation and home modifications, 901 North Jones Blvd., 702-648- 3425. • AARP Nevada State Office Contact Center, 5820 S.Eastern Ave., No. 190, Toll free 1-866- 389-5652, aarp.org/nv. • Nevada Secretary of State, 555 E. Washington Ave., No. 5200, 702-486- 2880, nvsos.gov. and www.livingwilllockbox.com offers no-cost secure way to file living wills and advanced health care directives for immediate access to health care providers. • Bridge Counseling Associates, 1640 Alta Drive, Ste. 4, 702-474- 6450, bridgecounselingassociates.org. • Community Counseling Center, 714 E. Sahara Ave. No. 103, 702-369- 8700. • Nevada State Medicare (SHIP), 1820 E. Sahara Ave., No. 205, 702-486- 3472. • Medicare State Health Insurance Assistance Program, Medicare counseling 1-800-633- 4227. • The Center for Compassionate Care, 4131 Swenson St., 702-733- 0320. • AARP Nevada State Office/Contact Center, 5820 S. Eastern Ave., No. 190, Toll free 1-866- 389-5652, www.aarp.org/nv. • Clark County Library District, 702-734- 7323, lvccld.org. Free computer training classes for seniors. Call for times. • OLLI at UNLV classes are for enjoyment. There are no tests, grades or credits. For more information about the program and membership, call 702-774-OLLI (6554). • First Person Care, 1200 S. 4th St., No. 111, 702-380-8118 or 200 E. Horizon Drive, Suite A-B, Henderson. • Southern Nevada Health District, 702-59- 1000. • Flu Shot Centers, 702-800- 2723. • FirstMed Health and Wellness Center, 400 Shadow Lane, No. 106; 3342 S. Eastern Ave., 702-731-0909. • Walgreens, 2389 E. Windmill Lane, 702-837-9531. Schedule an appointment or walk ins are welcome. • Southwest Medical, 2225 Civic Center Drive; 4348 E. Craig Road; 4475 S. Eastern Ave.; 5580 W. Flamingo Road; 270 W. Lake Mead Parkway, Henderson; 7061 Grand Montecito Parkway; 540 N Nellis Blvd. ; 4750 W. Oakey Blvd; 888 S. Rancho Drive; 2845 Siena Heights Drive; 10105 Banburry Cross Drive; 2704 N. Tenaya Way; 4835 S. Durango Drive; 2210 Calvada Blvd, Pahrump. • American Diabetes Foundation, 702-369- 9995. • Clark County Library District, 702-734- 7323. • DISCOVERY Children’s Museum, 702-382- 3445. Volunteers help on the museum floor and other events. • Foster Grandparent Program, Catholic Charities, 702-382-0721. • Helping Hands of Henderson, volunteers help with transportation for seniors to doctor appointments, grocery shopping and errands. Call 702-616- 6554. • Helping Hands of Vegas Valley, 2320 Paseo Del Prado, Bldg. B No. 204, 702-633-7264, hhovv.org. • Lending a Hand, 702-294- 2363. • Senior Companion Program, Catholic Charities of Southern Nevada, 702-382- 0721. • Southern Nevada American Cancer Society, 6165 S. Rainbow Blvd., 702-891- 9009. Need drivers to take cancer patients to and from treatments as well as other opportunities. • Three Square Food Bank, 4190 N. Pecos Road, 702-644-3663. • University Medical Center of Southern Nevada, 1800 W. Charleston Blvd., 702-224-7174. • Spirit Therapies Inc., 9140 La Madre Way, 301-351- 2669. A therapeutic horseback riding center. Duties include horse care, assist with lessons and interaction with families and children. • The Foundation Assisting Seniors, 725-244- 4200.